Sri Krishna says in Gita (9-29) “समोऽहं सर्वभूतेषु न मे द्वेष्योस्ति न प्रियः”। (Samoham sarva bhutheshu na may dweshyosthi na priyaha) I am same to all beings; there is none hateful or dear to me. This declaration He makes not as the son of Devaki but as Paramathma, whom we shall refer to as Iswara. But we feel in practice some seem to be recipients more of Iswara’s Grace or Iswara Kripa or Anugraha than others. What is the yardstick to qualify for the special Grace, one may wonder. I want to analyse it in this blog in the light of other statements Sri Krishna makes in the same chapter. As Sri Krishna says ‘I am same to all’, He does not choose anybody to shower special Grace; rather He showers His Grace equally on all. It is only we through our actions need qualify ourselves to take advantage of His Grace. Acharya Sankara illustrates this through an example. In winter people light a fire and sit around it. The fire gives the same warmth to all, but the one who sits near it seems to receive more warmth than the ones sitting a bit far off. Swami Paramarthananda gives an example from current scenario. Solar energy flows same to all, but the one who has erected a solar panel gets the benefit of electricity from it to escape power-cut. The one who has attained a higher degree of mental purity, through selfless prayer, worship and actions done in karmayoga spirit makes oneself eligible to take advantage of the Grace like the farmer who has tilled the land and sowed the seeds beforehand, gets greater benefit from the rains and reaps a good harvest as compared to the one who has neglected the field and let the water go waste. This Sri Krishna himself states in the second line of the above quoted verse: ये भजन्ति तु मां भक्त्या मयि ते तेषु चाप्यहं॥ (Ye bhajanthi tum am bhakthya mayi te teshu chapyaham) But those who worship me devoutly, abide in Me and I too am in them. This means that more you get closer to Him the more you feel His nearness to you. Now the question is “How to get closer to Him? Does it need special sadhanas like Vrata, Upasana, Yagna or a special Puja somewhere?” Sri Krishna Himself has given the solution earlier in the same chapter in verse 29. Whatever you do, whatever you eat, whatever you offer in sacrifice, whatever you give in charity, whatever you do by way of penance,O son of Kunti, do that as an offering unto Me. This attitude converts the very life itself of bhaktha as a worship of Iswara. There is no division as secular and religious work, as all work is treated as worship, being an offering to Iswara. With such an attitude one will not stray from the path of dharma; rather he will give up any bad or immoral habits, acquired earlier. Sri Girish Chandra ghosh, a disciple of Sri Ramakrishna Paramahamsa was a good dramatist but also a great drunkard. When he confessed his inability to give up drinks, Sri Ramakrishna asked him only to offer every glass of drink to him before taking it. Gosh did accordingly but could do so only for one day and from the second day onwards, he could not bring himself to offer the drinks to his master and so gave up the habit of drinks itself. 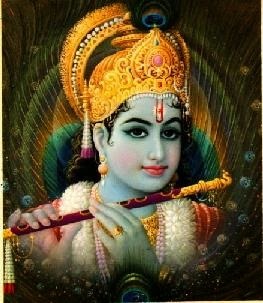 When one invokes God in all of one’s actions sincerely, one acquires selflessness in actions. As God comes more in one’s life, the less the play of ego in one’s life, as what is ego but edging god out and replacing it with ‘I’. Sri Krishna goes on to list a few actions, the first among them being food. The food we take has a great impact on our thoughts. The more satvic the food the more satvic tends to be our mind. In Chandogya Upanishad Sanatkumara tells Narada “आहारशद्धौ सत्वशुद्धिः” (Aahara suddhau satva suddhihi) When nourishment is pure, thought processes of the mind also become pure. When one performs religious acts or sadhanas offering them to Iswara, he eschews selfish motive in performance. As one gives everything with the mindset that he is giving to none other than Iswara, he cultivates humility and eschews arrogance that comes from a feeling of superiority as giver. Such a virtuous, selfless, egoless action done with humility and with dedication to Iswara earns one Punya, good karma-phala. Swami Paramarthananda in his lecture on God’s Grace observes that God's Grace is only another name for the ripe Punya-phala that becomes ready for tapping, because God as karma-phala dhata has no preferences and only acts as per the law of karma laid down by Himself to regulate our lives. When the accrued Punya becomes ripe for tapping is not within one’s knowledge. So when one enjoys the benefit of ripe punya-phala it looks as though one is enjoying special Grace. So if one wants the favour of special Grace let him through righteous, selfless, egoless actions performed with humility and devotion, earn the Punya-phala and make oneself eligible to receive the Punya-phala as His Grace, which may be then or later, depending upon when it becomes ripe and ready for tapping.